When trout are feeding at the surface and in chasing mood nothing beats the thrill of pulling wet flies through the upper layers. It's visual, action-packed and full of excitement. Russell Hill returns to an old and often forgotten technique with the regulars of Staffordshire's Tittesworth Reservoir to target the water's rainbow trout. A GUST of fresh air breathes life over the water and pockets of fish turn at the surface. The sky's full of broken cloud offering a perfect balance of sunlight and shade. I exchange a knowing look with my boat partner - we're in luck. The fish are up and in lively mood. Our electric engine's soft whir is barely audible as we gently manoeuvre the boat onto the first drift. Already I feel life's stresses flow out of me and I'm eager to enjoy the action on offer at this scenic, top-of-the-water reservoir. Drifting parallel to the shore we spot fish head-and-tailing only a few metres from the boat. After a short cast my team of two palmered wet flies lands delicately on the water. Two V-shaped wakes slice the rippled surface as I strip back the flies. The surface chevrons are bound to attract a take. Anticipation pays off and a thick, rolling wall of water gains pace behind – a fish has locked on, no doubt attracted to the wake and the flies' brightly coloured tags. Heart pounding, I quicken the pulls hoping to feel solid resistance as the trout grabs hold. At the end of the retrieve there's still no take. But I'm excited enough to immediately re-cast hoping the fish is still on the look out - you often get a second chance. Ripping the flies back, the bow wave re-appears - I've retrieved right across the fish's nose. This time...a pluck. After a quick one-metre pull, the fly line tightens and I'm into a fierce scrap. Water sprays everywhere. After initially breaking the surface, the strong, silvery flash heads deep and refuses to budge. With powerful runs left and right it heads straight under the boat and the rod tip follows. The reel screeches as the fighting fish gains line. Eventually, I manage to pull the fish to the top, get its head out of the water and draw it over the net. Phew! It's a pristine blue trout of 2lb-plus, surprisingly small for the fight. But the method, battle and quality of the fish make it a pleasure to catch. This is wonderful fishing and pulling wets is something every angler should try to rediscover - especially those slightly jaded with the sinking line and lure approach. It's action packed and extremely good fun. Of course, dry fly sport is exhilarating, but it's static when compared to the constant movement of a wet fly fisher working his flies. Visually stimulating, hours can while away as the angler becomes absorbed in casting, retrieving and watching the fish chase. If you're looking for an exciting method to 're-light your fire' then look no further. It was the lochs and loughs of Scotland and Ireland that first introduced us to the world of wets. Then, visiting anglers took the patterns back home and tweaked them to suit their particular waters. The result is a wealth of variation that characterises today's wet fly patterns. Some 'older' readers may recall that at one time, traditional wet fly fishing was the method to use - if you went boat fishing, you used wets. But as techniques progressed and new developments appeared the art of wet fly fishing became largely forgotten. TACKLE ROD: Choose a 10 or 11ft, middle-to-tip or through-action, five or six-weight. A longer rod allows you to work the flies further from the boat. FLY LINE: Nigel uses a double taper floating line offering gentle presentation. The thick belly section is in the middle of the line with the ends tapering to a thin point. A weight forward line, with the bulk of its weight towards the front, can splash down on the water and spook fish. LEADER: Sightfree fluorocarbon. It's clear, strong and is a good compromise in diameter - not too thick or thin. It's also not too stiff or shiny. Fluorocarbon is handy for wets but you don't want it to sink too quickly - 6lb is a fine balance. If fish are really fussy Nigel sometimes reduces the diameter. KNOTS: Nigel uses a Grinner Knot for droppers with an Improved Clinch Knot for connecting the flies. Use a Fourturn Water Knot for droppers. In the right conditions - overcast and warm with a good breeze - wets will work just about anywhere, but it's an advantage to choose a venue where fish look up for their food. In nutrient-poor upland waters, trout rely on terrestrial insects blown onto the water from surrounding trees and moorland, so they're constantly looking up for food. These fish usually chase wet flies at the surface. Two hundred acre Tittesworth reservoir is one such fishery. 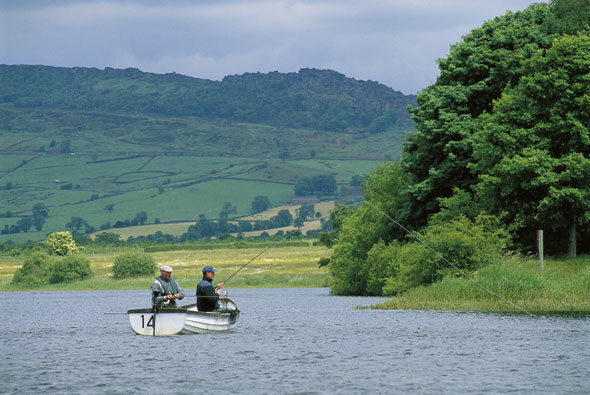 Tree-lined in areas and always under the imposing shadow of the 500ft Roaches Ridge, picturesque Tittesworth offers the kind of idyllic surroundings anglers dream of. The many bays and inlets appeal to those bank anglers craving intimate sport - creeping up on unsuspecting fish as they swim around tree roots and reed stems. Then there are the many productive drifts available to boat anglers across the middle or parallel to the shore, provided of course that the draw off doesn't lower water levels too much. The whole place is a scenic, tranquil oasis and one that deserves a fishing technique more in tune with its beauty. I couldn't imagine casting a fast sinking line with a team of Blobs here. Anglers come here to enjoy a bit of top-ofthe- water finesse. With the fishery responding to wet flies, it's no surprise that many of the regulars are masters of the art. Former match anglers Nigel Nixon and Stan Forrester are disillusioned with the way competition fishing has developed. Having previously been successful in the old Benson & Hedges competitions, they don't like the 'quick limit' and big cash prizes of today's match scene. Instead, they enjoy a method that first captivated their interest over 30 years ago. Their boat is expertly positioned to start their first drift, just off Carrs Point, which marks the boundary to the dam basin. Immediately Stan pulls a fish. Nigel politely reels in his line until the fish is netted. Now it's Nigel's turn to enjoy the action. After retrieving he stops the flies and dibbles the wake fly enticingly across the top. A following fish cannot resist and it grabs the fly close to the boat. This pattern continues with both men matching each other fish for fish. Watching two anglers casting short lines and catching fish on small flies close to the boat only fuels my enthusiasm to have another go - it all seems so effortless and there's plenty of action. The smooth loops of fly line contrast against the trees and the flies land so lightly on the water - slowly floating down as the leader unfurls. SIXTY-EIGHT year old Stan Forrester began fly fishing almost 30 years ago and after a spell with lures he discovered traditional wet flies and became smitten. He continued with wets until taking up match fishing about 12 years ago. After a credible 5th position in the Benson & Hedges champs he started to lose interest in competitions. "It's the way that match fishing is evolving that troubles me. The competition scene, and to some extent the angling media, seem to be pushing anglers towards sinking lines, Blobs and 13lb leader. To me, that's not really fly fishing. I prefer the finesse of wet flies and feel that youngsters are missing out on a really exciting method." Both anglers continue to drift slowly towards the cages enjoying the many chasing fish coming their way. Even from distance, we're gripped spectators excited by the rolling bow waves locking onto the flies like underwater guided missiles. Stan, a former coal miner, has three flies - a Silver Invicta on the point with a Peter Ross in the middle and a Steely Blue on the top dropper. Stan usually sticks to a figure of eight retrieve and then stops the fly suddenly - this is when he gets a lot of takes. Obviously, the fish follow the disturbance fly, which stops when the rod is raised and held. The fish either takes it or turns away and snaps up the next fly it sees following behind. The chasing trout is attracted to the bushy wake fly. 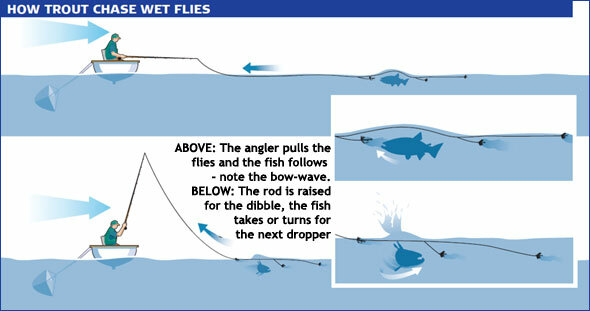 As it chases, speed up the retrieve and then dibble or hang the flies. Working in transport management, 54- year-old Nigel Nixon claims former Welsh international Selwyn Hughes to be the main reason he took up wet fly fishing. Selwyn was the bailiff at Tittesworth when they took over management from Severn- Trent Water about 20 years ago. It was Selwyn who introduced the Harry Tom fly to Tittesworth and it's still very successful today. Looking for rising fish, Nigel casts to them and begins a steady figure of eight retrieve all the while anticipating a chase. Nothing happens, so he adds variety. Casting 10 to 15 yards he gives two or three steady pulls and then starts lifting the rod. Holding everything still he feels a "thud" and his rod tip jolts abruptly. A following fish took his middle dropper as soon as the fly stopped moving. While retrieving, takes are usually straightforward lock ups. But whether in motion or static, all takes are usually confident because the fish see the fly as a natural food form. And because they're focussed on the fly they will chase right up to the boat. Says Nigel: "Wet fly fishing is not just throwing a long line and stripping the flies back, although this might work well on the day. It involves a variety of techniques including short lining, lifting, dibbling and holding the flies still. People are locked into today's methods and they've largely forgotten the thrill of fishing wets." Nigel maintains that many of today's sunk-line tactics result in anglers often fishing below the fish. Wet flies fished on or just below the surface will produce more trout on many occasions. Continues Nigel: "Anyway, to me, traditional wets and dry fly is proper fly fishing. I've fished all techniques but this is my favourite. Anyone who says wet flies no longer work should go out next time with an open mind and try it." Being experienced anglers, Stan and Nigel use long leaders - Stan's is 15ft and Nigel's 22ft. This is important for wet fly fishing but so is the spacing between the flies. There has to be a long length from the end of the fly line to the top dropper fly. This allows the angler to work the flies - dibbling, holding etc - well away from the boat. On Nigel's 22ft leader he has 11ft to the top dropper, 5ft to the middle and 6ft to the point. First time wet fly anglers might find Stan's set up easier to manage. His 15ft leader comprises 7ft to the top dropper with 4ft between the flies. If those new to this method are uncomfortable with three flies on a leader, Nigel suggests using two- although you could be significantly reducing your chances. The fly you omit could be the one that really works on the day. With a softish rod and a little casting practice, turnover will improve and then it's best to use three flies. Softer, middle-to-tip or through action rods cast open loops, reducing the risk of tangles. Tighter loops mean the droppers have every chance of tangling around the leader or fly line as the loop is made - especially if it's windy. MORE fish come and both anglers regularly play fish simultaneously. But why is this particular area of Tittesworth productive today? Says Stan: "Drifts across the centre of the reservoir are good, but during summer many fish move towards the deeper water near the dam. The trout start off in the shallows during early season then they move to the deeps through summer, ending up in the shallows again during late September." Wet fly fishing seems to work early season, as soon as the fish are at the surface. Through July and high summer the trout often prefer static dries, but the fresher winds of September render wets a worthy option again. After countless fish, it's time for a break and our two anglers retire to the shelter of the wooded Scar Hole - upwind of the dam basin. It's here that they discuss their flies, rigs and memories in more detail. Things tend to go around in cycles. In the days of the B&H championship they would go out on the Midland reservoirs and catch huge bags of fish all on wets. In the early 90s, dry fly was the top method. What will the changing trends in modern fly fishing bring next? Maybe a return to the good old days of wet fly fishing? Let's hope so.